The Arizona Geological Survey (AZGS) staff perused geologic events of the past year and selected those below as some of the top geology-related stories in Arizona. The stories range widely from geologic hazards, to Arizona’s national and international ranking as a jurisdiction amenable to mining, to the precipitous decline in copper prices. Stories are in rough chronologic order from latest, copper prices retreat to ~ $2 per pound in December 2015, to earliest, Arizona was #1 in U.S. in non-fuel mineral mining in 2014. Did we miss a story? Undoubtedly! What geology story would you have included? 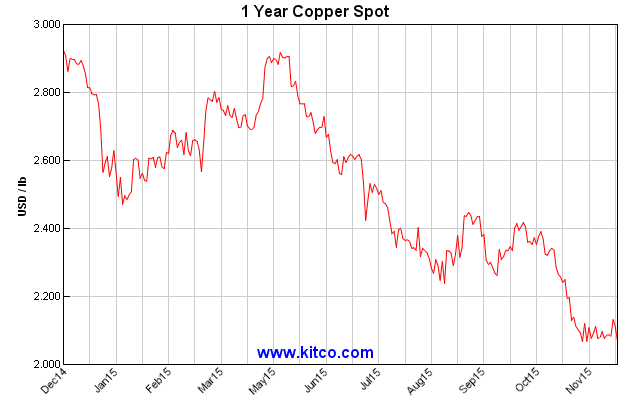 Copper Prices, oh my! 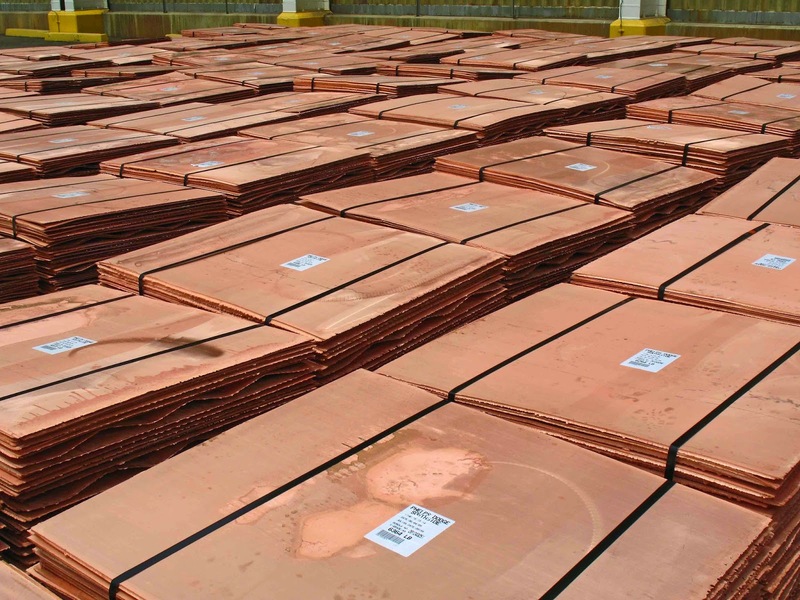 Global copper prices tank, falling to the ~ $2 per pound level and pitching Arizona copper mining into a tailspin; in response to the weak market, Freeport-McMoRan announced they would close their Sierrita Mine. The good news? Copper will come back as the global economy rebounds and as nations continue to migrate to green energy. Earlier in the year, Governor Doug Ducey signed legislation naming copper as the official metal of Arizona. Graphic by Kitco.com. 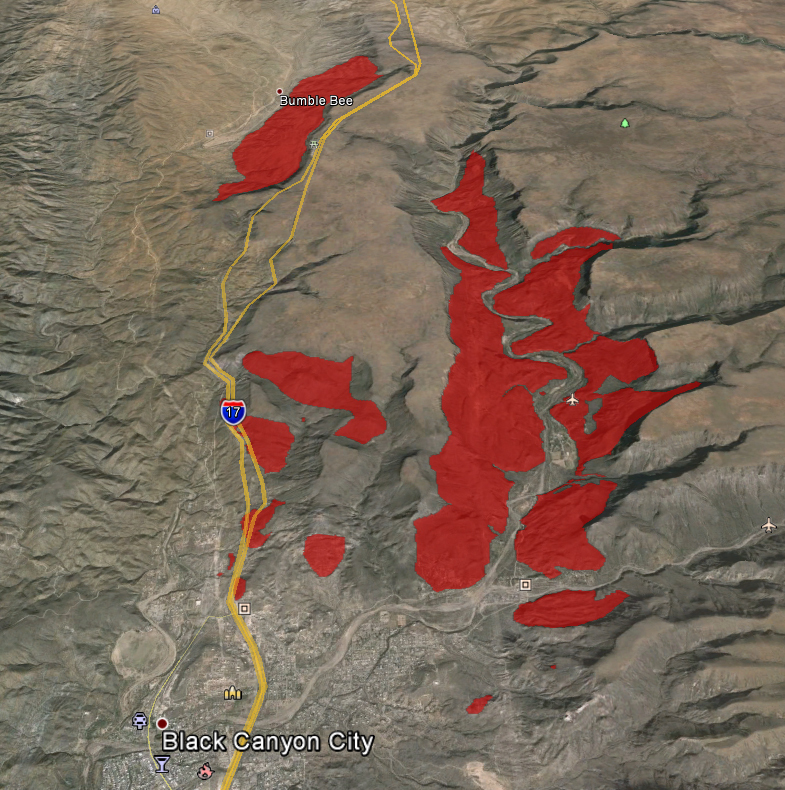 My Turn – Geologic Hazards in Arizona. "Earthquakes threaten Arizona (and that's not all)," an op-ed piece by AZGS Director Lee Allison on geologic hazards appeared in the November 15 edition of the Arizona Republic. It followed in the wake of the magnitude 4.1 earthquake that rocked Phoenix. Dr. Allison described many of the geologic hazards that threaten Arizona: earthquakes, landslides, wildfires, floods and earth fissures. He called for a comprehensive solution involving surveying, monitoring and better construction. EARTHQUAKE shakes Phoenix! On November 1, 2015, Phoenix was rocked by a magnitude 4.1 earthquake originating north of Black Canyon City. 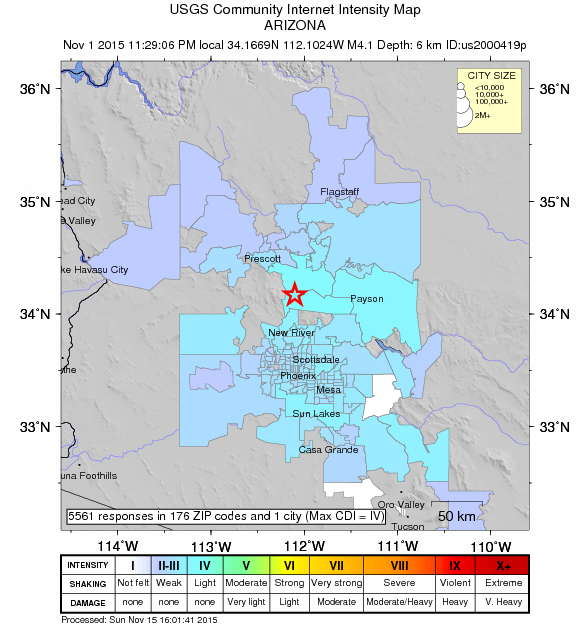 Ground shaking was widely felt across the Valley of the Sun, and as far north as Flagstaff and south to Casa Grande, Arizona. Thousands alerted the U.S. Geological Survey (USGS) through its online “Did you feel it” survey tool, but it’s probable that 100,000s to millions of people felt the ground move. Media in the Phoenix-area followed the event closely and AZGS staff responded to more than a dozen inquiries about this earthquake and the likelihood of other damaging earthquakes in Arizona. AZGS pioneers mapping aggregate resources. 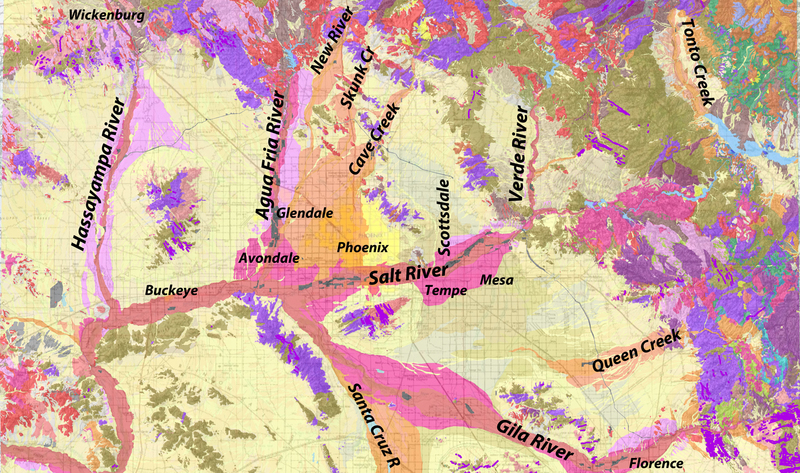 AZGS released its first geologic database for aggregate resource assessment for the Phoenix metropolitan area. This map product should inform local and county planning and zoning authority decisions as they address SB 1598 (2011) regarding conservation and management of aggregate resources. What’s in a map? 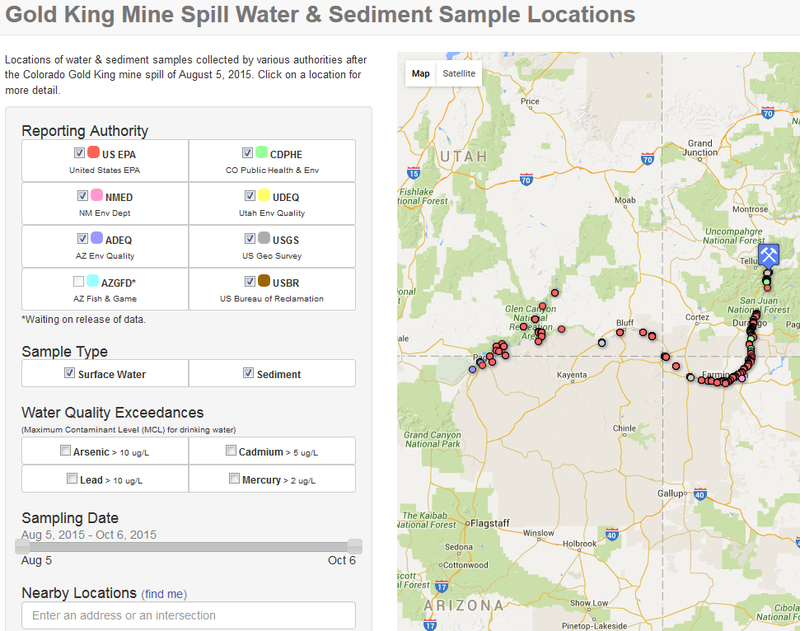 In collaboration with federal and state agencies, AZGS built and launched the interactive Gold King Mine Spill water sampling map that displays sample sites linked to data for water chemistry samples from the Animus River, San Juan River and Lake Powell. The spill adversely impacted portions of Colorado, New Mexico, Utah and Arizona, and tribal lands of the Ute and Navajo people. The Gold King Mine map informs stakeholders, decision makers and the public regarding sampling and water quality status. Landslide inventory program kick off! 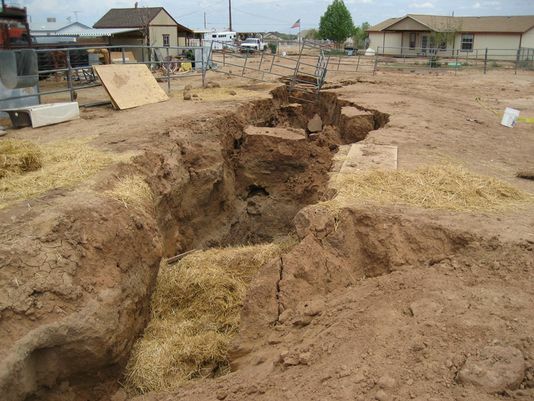 AZGS launches the state’s first comprehensive landslide inventory program. Over the past year, our environmental geology section has identified more than 6,000 landslide masses, greatly improving our knowledge base of the distribution of landslide occurrences in Arizona. This should, in turn, inform landslide hazard assessment and mitigation going forward. Look for the results to appear on our interactive Natural Hazards in Arizona viewer in 2016. Famed geologist dies. 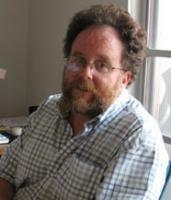 William (Bill) Dickinson, Professor Emeritus in the UA Department of Geosciences, passed away on 20 July while on an archaeological field trip to Nuku'alofa, Tonga. Dr. Dickinson was a pioneer in the plate tectonic revolution. 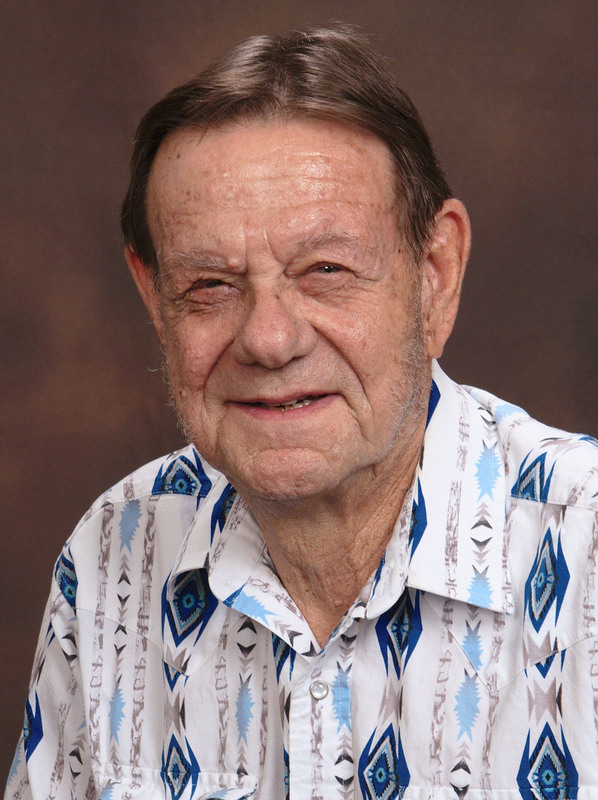 "Bill Dickinson was a bigger-than-life guy in a bigger-than-life place," said his close colleague George Davis, UA Regents' Professor Emeritus of geosciences (from UA News, 27 July). State Geologists descend on Flagstaff. AZGS hosted the 107th Annual Meeting of the Association of American State Geologists (AASG) in Flagstaff in mid-June. Over 150 people attended including active and former state geologists, their guests, and USGS staff led by Acting Director Suzette Kimball. Gem, Mineral and Fossil show feeds Tucson economy. In February 2015, Tucson News Now reported that direct spending during the two-week 2014 Tucson Gem, Mineral and Fossil showcase topped $120 million. The Tucson Gem and Mineral Society kicked off this world-class mineral, gem and fossil event 61 years ago. The 2016 show marks the 62nd consecutive year. Arizona is #1! In January 2015, Arizona was recognized as the #1 mineral-producing state (non-fuel) in the U.S. for 2014. 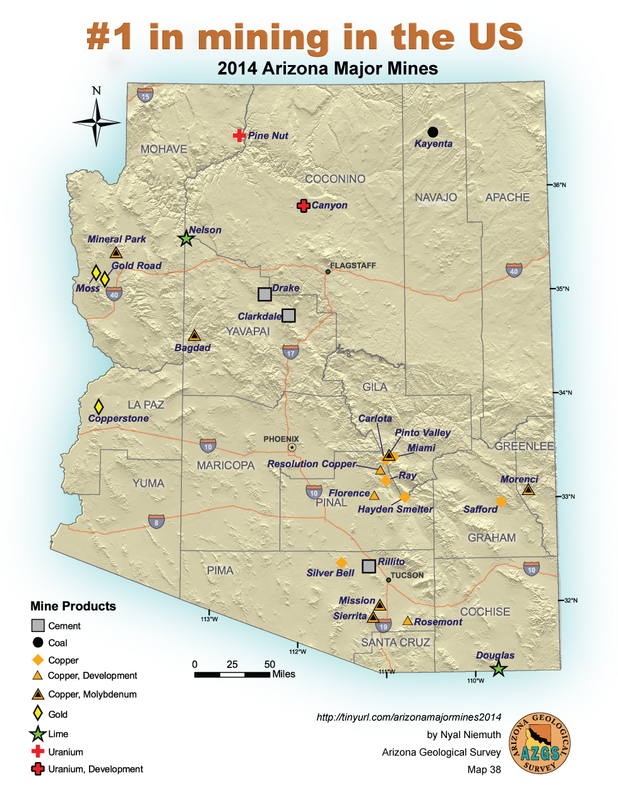 The 2015 Mineral Commodities Summary reports that Arizona produced $8.06 billion worth of minerals in 2014, or 10.38% of all non-fuel minerals in the nation, with the principal minerals being, in order; copper, molybdenum concentrates, sand and gravel (construction), Portland cement, and crushed stone. Nevada was a close second with $7.490 billion or 9.66% of the national production.